It is mid-January. 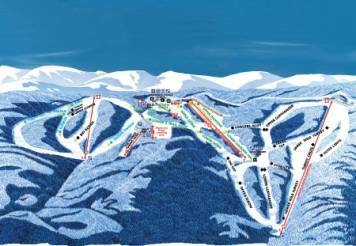 I am anxiously awaiting a ski trip I have booked for Sun Peaks, British Columbia. Why not a tune-up ski trip to ensure I have the clothing I need and can pre-test my ski skills? 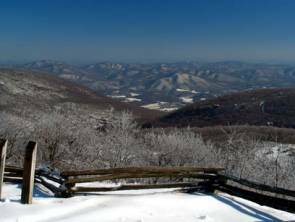 A friend informs me that she has a ski-in, ski-out condo at Wintergreen -- the most well-known ski resort in Virginia. She also lets me know that I can carpool from Richmond for the 90-minute drive. I’ve never skied in the eastern US, and have often heard the ski conditions pale in comparison to the dry powder in the western US: Wet, heavy snow and ice is common in the east, I’m told. Nevertheless, it is just too easy for me to sample Wintergreen, so on a chilly day, I get into his white Volvo station wagon for my first taste of eastern skiing. For almost the entire ride, we don’t see much snow at all on the ground, despite reports that western Virginia now has a blanket of snow from recent storms. But as we enter the resort, more snow appears. We drive by one of the ski runs and I remark to my ski buddy that the conditions look surprisingly good. Glancing at the Wintergreen trail map, I immediately learn that the resort has a relatively modest number of trails to ski. There are two main areas separated by a ski-through masonry archway. With very few skiers here on this mid-week day, I find that I am able to ski all of the blue and black trails within an hour or two. After an blue (intermediate) run, which is surprisingly unchallenging compared to what I am used to in western skiing, I approach my first black run. A bright orange warning sign hangs at the beginning of the run: “EXPERT ONLY”. Very slowly and carefully, I ease my way down this “expert only” slope. I soon realize that I am more than capable. Indeed, after finding the run surprisingly negotiable, I decide to try something I’ve never even dreamed of considering before: a DOUBLE black diamond. In past skiing, I’ve been so terrified of double blacks that I’ve come to expect a skull and crossbones on the sign for such a run. Fully expecting death at any minute, I am skiing this double black of doom. Again, I am astonished by how negotiable it turns out to be. Why are blacks here so much easier than I am used to? Is it the lack of snow? Is it the fact that eastern and western skiing has dramatic differences in difficulty ratings? Nevertheless, my day of skiing at Wintergreen is enjoyable and somewhat exhilarating. Lift lines are non-existent on this day, so I get a lot of runs in. As I learn the slopes, I am soon rocketing down them at rather blindingly high speeds. The snow doesn’t seem heavy, and very little ice is experienced. At least on this day. 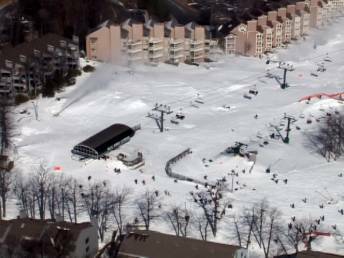 My only regret on this day is that Wintergreen is apparently making as much snow as it can as fast as it can, in order to maximize the number of slopes that are open, and to compensate for the relatively modest snowfall. Nearly every single snow-making machine on the mountain seems to be noisily spewing out clouds of snow -- perhaps 24 hours a day, as far as I can tell. The result is that ski lifts often take the skier through a cloud of this faux snow, which makes for a chilly, noisy ride. Regretfully, this inhibited two things I particularly enjoy while skiing: An exceptionally quite ambience (which is largely the result of the muffling affect that a blanket of snow creates), and the ability to chat with my ski companions while on a lift. With so many tall, metal, spider-like snow machines running today, it is as if War of the Worlds has met Frosty the Snowman. I am not faulting Wintergreen for this snow-making effort. They are clearly working hard to improve their ski conditions for the coming days. Will I return to Wintergreen? Absolutely.